In the second paragraph under the heading "Register at MyAGU", you'll see a button to "Register". It seems to be an different process than it was last year. I'm not sure that it's better. The server seems to be the one to decide whether you'll get video or just audio only, which is all rather horrid if you don't pass the server's test :( I've never been denied video before from AGU (or any other website), so their test is far too restrictive IMO. It works sometimes, so if you're having trouble like me, persevere and you may get lucky. Anyway, I'm still figuring it all out, so if you have tips, please add them in the comments. For example, last year you could access posters, but I haven't figured out where they are this year. Since posting this article, I've explored the AGU15 website more. This year you can select different channels, such as the climate channel, the earth discovery channel, extreme events and hazards channel and more. That's extremely helpful. Here are some images of the pages from which you'll get most of the sessions. Back to the main screen for watching sessions. Click to enlarge and you'll see that you can switch between a full list of the sessions in the channel you've selected, and the on-demand presentations available. If it's the same as other years, most but not all sessions stay up after they've been given. (Some you might only be able to watch live.) 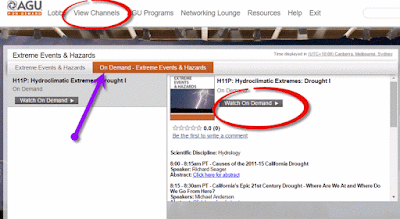 The session below is on the Californian drought, available on the Extreme Events and Hazards channel. The main AGU Fall Meeting Scientific Program is here so you can plan what you want to attend. 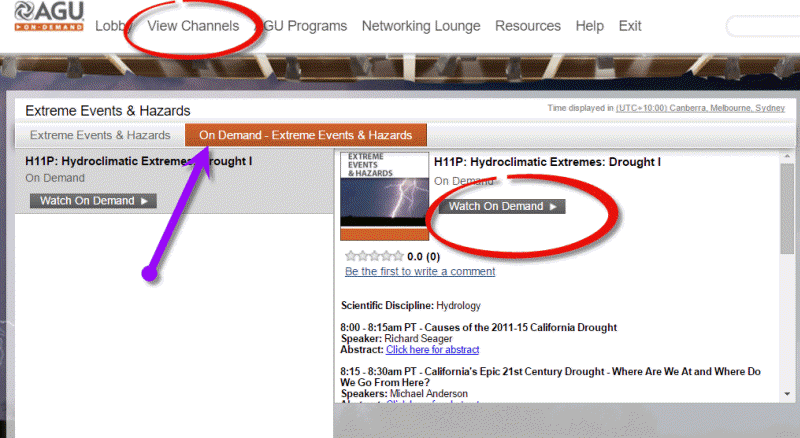 Click on "AGU On Demand" then select a day, or scroll through using the arrow on the right of the page. PS I'll update this article with more tips, as I uncover them. I probably won't be posting much this year, because I can't access the video. AGU seems to have blocked video if it figures the bandwidth isn't sufficient. And it's set the threshold low (I can stream video from everywhere else except AGU). I could probably get it if I used my wifi connection instead of ADSL, but that would eat up my quota too quickly. Apologies for the whine, but I was so looking forward to AGU15. It's really disappointing to not have access. If you see sessions that you like, post a link to them in the comments. I'm now able to get video as well as audio, so if you are having trouble I suggest you persevere. Free, RSVP required. Email reserve@exploratorium.edu, or call 415.528.4444 and choose option 5. As global temperatures slowly rise, ice caps at the north and south poles are melting. This is bad news for walruses, Weddell seals, and other animals that live on the ice. Whale species that frequent the Arctic Ocean are beginning to change their migration patterns. Join a conversation about how research on marine mammals reveals the effects of climate change on Earth’s ecosystems." Also, it appears that anyone in SF can go even if they're not registered for the conference (until spaces run out) though I've not tested it, being at the SMM conference. I'd happily contribute to a crowd-funded action to have Watts officially attend the SMM conference and present a poster on how marine mammals can't be affected by climate change because it's not real. The only stipulation would be that he report back verbatim the responses he receives. maybe if he went to enough conferences and actually listened, then some of it would eventually start to sink in. I was told no posters this year, which was disappointing. I had video, but would have been happier if I could have had the option of selecting audio instead. I really hope Richard Alley's public Sunday talk makes it onto YouTube.